Glamorgan all-rounder Graham Wagg is likely to miss the One-Day Cup match against Kent on Tuesday as he recovers from concussion. 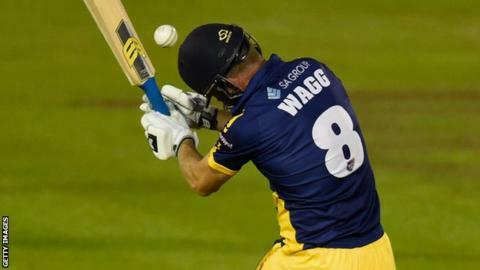 Wagg was struck twice on the helmet while batting in the T20 defeat against Gloucestershire on Friday. The 32-year-old's condition will be monitored by club medics before he is allowed to play again. "We've got to err on the side of caution," explained Glamorgan physiotherapist Mark Rausa. "It's probably quite frustrating for Graham, but because of what we know about concussion and changes in brain chemicals, a secondary incident could lead to much more damaging prospects." Wagg, who was left out of the squad for the abandoned One-Day Cup opener away to Nottinghamshire, could also sit out the game against Essex on Friday, 31 July. Graham Wagg is treated after being struck on the head during Glamorgan's match with Gloucestershire. He suffered a blow to the jaw in the first incident against Gloucestershire, but was then pole-axed by a delivery from Craig Miles which struck him on the tip of the helmet. Wagg was forced to sit out the rest of the match which Glamorgan lost by eight wickets. The issue of head injuries has been thrust into the limelight by the death of Australian batsman Phillip Hughes in November 2014 after being hit while playing for South Australia against New South Wales. "Graham's a very strong-minded and hard guy," added Rousa. "If he'd been given the choice he probably would have wanted to stay on but, after a blow like that, as soon as you see any signs you've got to get them off. "What he has to do is have regular assessments from a doctor or neurologist. Dr Rob Young will be seeing Graham a couple of times in the next week... and then we can start a return-to-play protocol." Wagg had played in every first-team game for Glamorgan in 2015 before the match against Nottinghamshire, where he was replaced by Ruaidhri Smith.